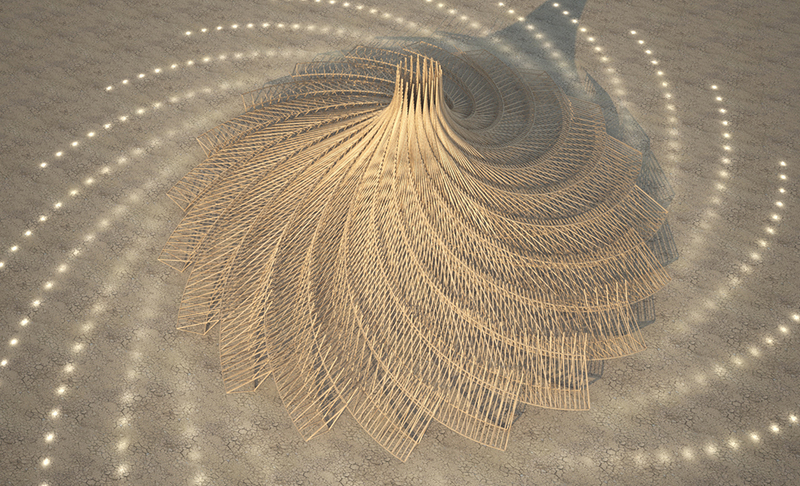 The central temple for Burning Man 2019 has been revealed, and architect Geordie Van Der Bosch has chosen to keep the building simple and linear. 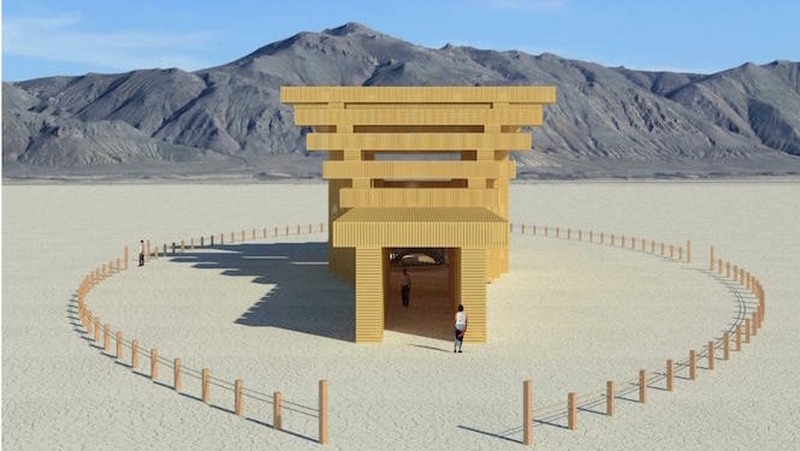 As opposed to last year’s digitally-fabricated, fractal-invoking Galaxia, 2019’s Temple of Direction references traditional Japanese torii gates and presents a clear entrance and exit. Burning Man takes place on the "playa" of Black Rock Desert in Nevada every August, and 70,000 attendees are expected to crowd into the temporary Black Rock City this year. The theme for 2019 is “Metamorphosis,” and the Temple of Direction is appropriately supposed to represent a journey for the viewer. The 180-foot-long, 37-foot-wide, 36-foot-tall temple specifically references the gates of the Fushimi Inari-taisha shrine in Kyoto, Japan. Visitors will pass through a narrow opening that gradually widens to a great hall in the center of the temple before they pass into an open-air gap and exit through the other end. The four entrances to the temple have also been aligned to the four cardinal directions, and the entire installation will be encircled by eye-shaped fencing. According to the Burning Man Journal, “This linear form reflects the passage of life with its beginning, middle, and end. Throughout the structure, there are areas that reflect this journey: narrow & wide spaces, bright & dark spaces, and tunnels that create intimate physical settings. Meanwhile, a large central hall, an altar, and many shelves for offerings create the setting for our collective experience.” The San Francisco–based Van Der Bosch has lived in England and Japan previously (near the Fushimi Inari-taisha shrine his temple is based on). He’s also an avid Burning Man attendee, having been to seven previous festivals. Interested in helping realize the Temple of Direction? 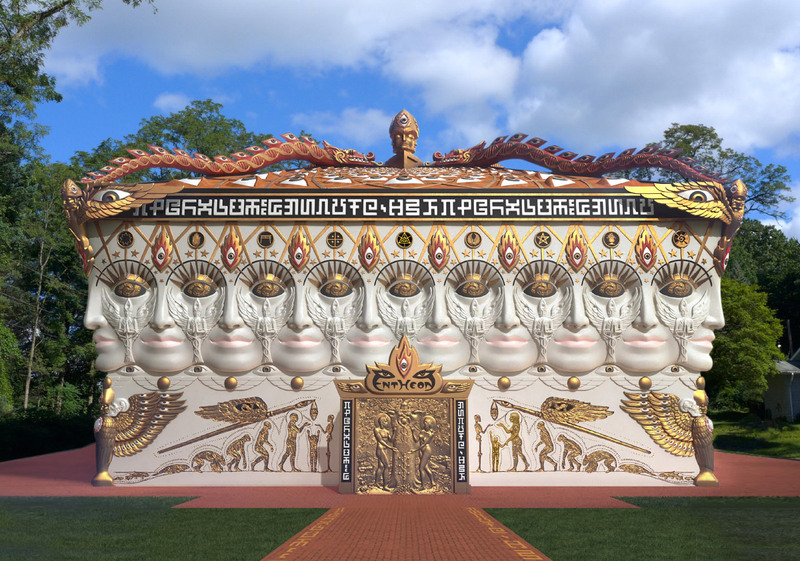 Festival organizers are currently looking for volunteers to help fabricate the temple in Oakland, California, and will begin fundraising to cover the construction costs soon. Of course, as is the Burning Man way, the entire temple will be set on fire and razed when the festival ends on September 2. Fans of large metallic spheres rejoice: The ORB rises. Despite not meeting their crowdfunding goal, Bjarke Ingels and Jakob Lange of Bjarke Ingels Group have successfully created their installation at this year's Burning Man festival in Black Rock City, Nevada. The pair launched an Indiegogo campaign earlier this summer with a goal of raising $50,000 for the project. At the time of writing this article, the pair had raised $34,251 pledged from 127 backers. AN spotted the ball in Burning Man's official Youtube live stream of the event. 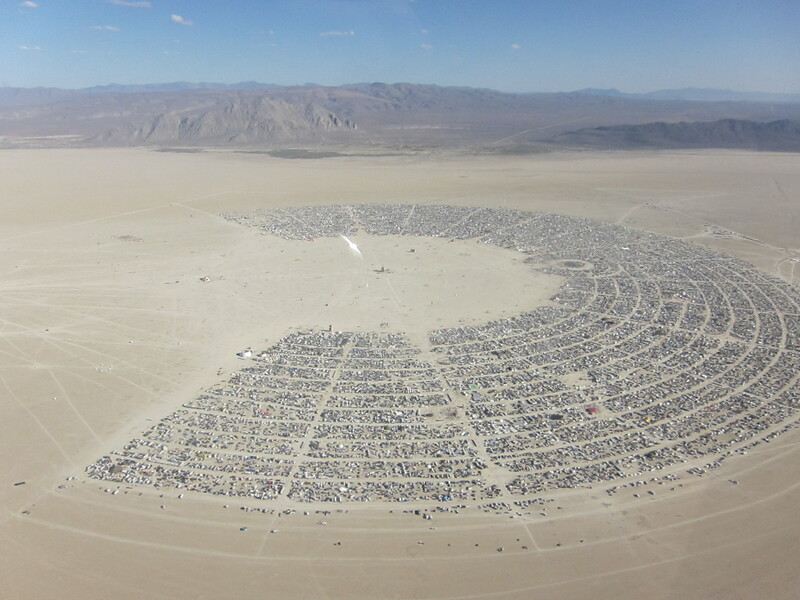 The stream peers around the site of the event, known as the Playa to festival-goers, who are also known as Burners. Jakob Lange posted a construction image of The ORB last week to his Instagram account, but neither architect has released official imagery of the project. Burning Man is a temporary event in the Nevada desert where thousands of participants camp, build temporary structures, and engage in various activities of a psychedelic nature. 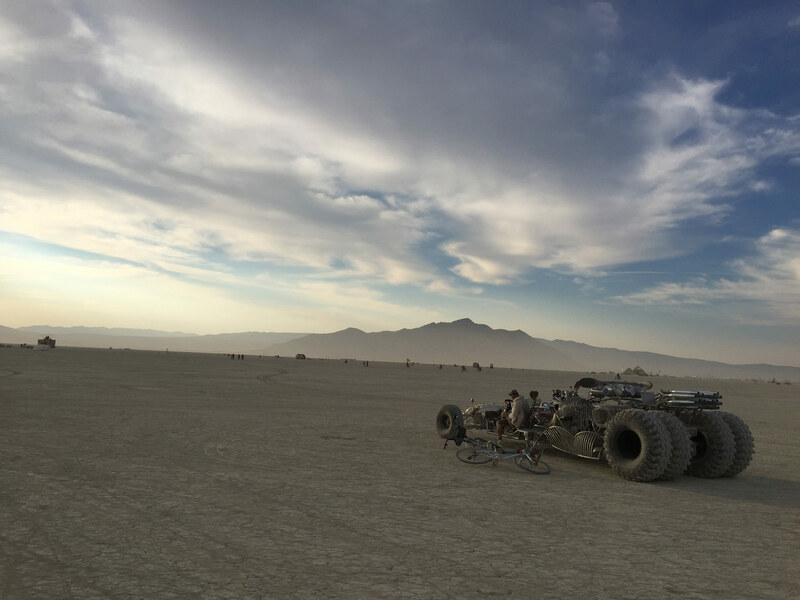 In recent years Burning Man has become synonymous with Silicon Valley and the way in which counter-cultural experiences can be commodified as expensive entertainment. Basic tickets to the week-long festival cost upwards of $300. According to the architects, The ORB will be "a new planet to sci-fi fans, a wayfinder for travelers or just a huge disco ball to those who love a good party!" Although it appears to float above the ground, the 83-foot sphere is held up by a 105-foot steel mast. Renderings and prototype studies showed a mirrored metallic surface to the object, although in the live stream it appears to be either duller or covered in desert dust. The structure will be up during the festival this week, when it will be presumably be dismantled or destroyed along with the rest of the festival's structures. Bjarke Ingels and Jakob Lange of the Bjarke Ingels Group (and BIG Ideas, the studio's in-house think-tank) have launched a crowdfunding campaign on Indiegogo for its Burning Man 2018 project. 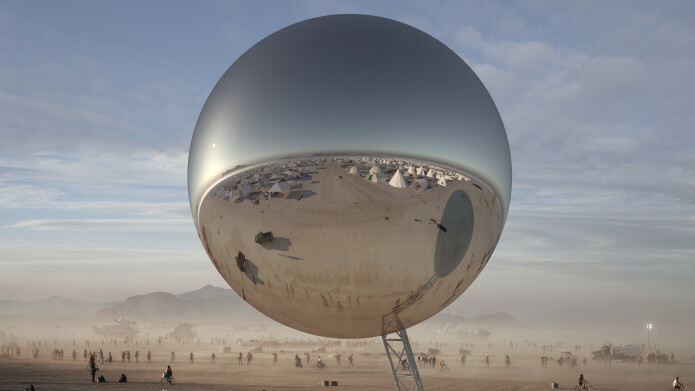 ORB is an 80-foot-wide reflective sphere that, if funded, would bring an elevated mirror, wayfinding symbol, and “temporal monument” to the Black Rock Desert’s Playa in Nevada. ﻿﻿﻿﻿﻿ ORB borrows the Earth's form (at 1/500,000th of the scale) to create a 360-degree mirror that will reflect the sky above and goings-on of the Burners below. Although the ORB will be inflatable to reduce the project’s environmental impact, the piece would be hoisted into the air via a 30-ton, 105-foot-tall steel arm. 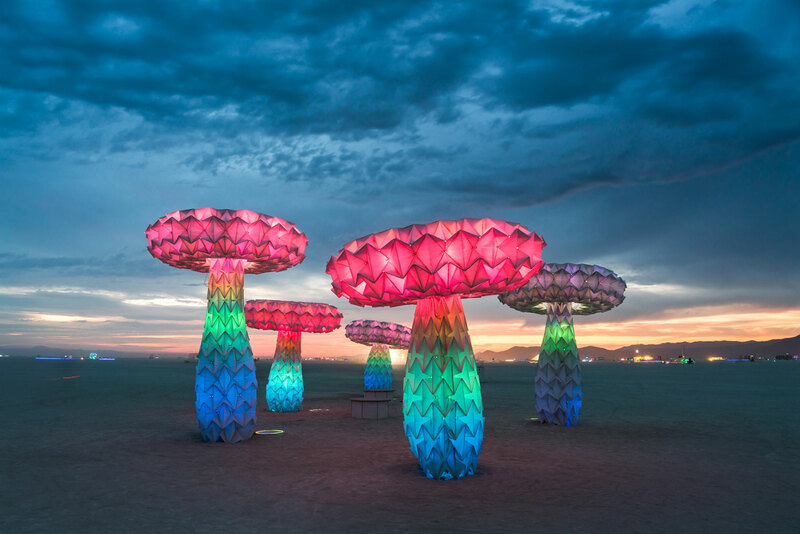 BIG partner Jakob Lange writes that the installation is a “tribute to mother earth & human expression,” and the piece will seamlessly blend into the desert sky at night as the festival lights dim. Below, the ORB will create a “light shadow” and help visitors navigate the festival's transitory metropolis, the 50,000-strong Black Rock City. The studio is looking to raise $50,000 before the start of this year’s Burning Man, which will run from August 26 through September 3. Backers can pledge to receive engraved stainless steel orbs of varying sizes, with a 40-inch-wide ball going to those who pledge $4,000 or more. Ingels is no stranger to the mind-expanding arts and culture festival, having thoroughly documented his prior trips on Instagram. 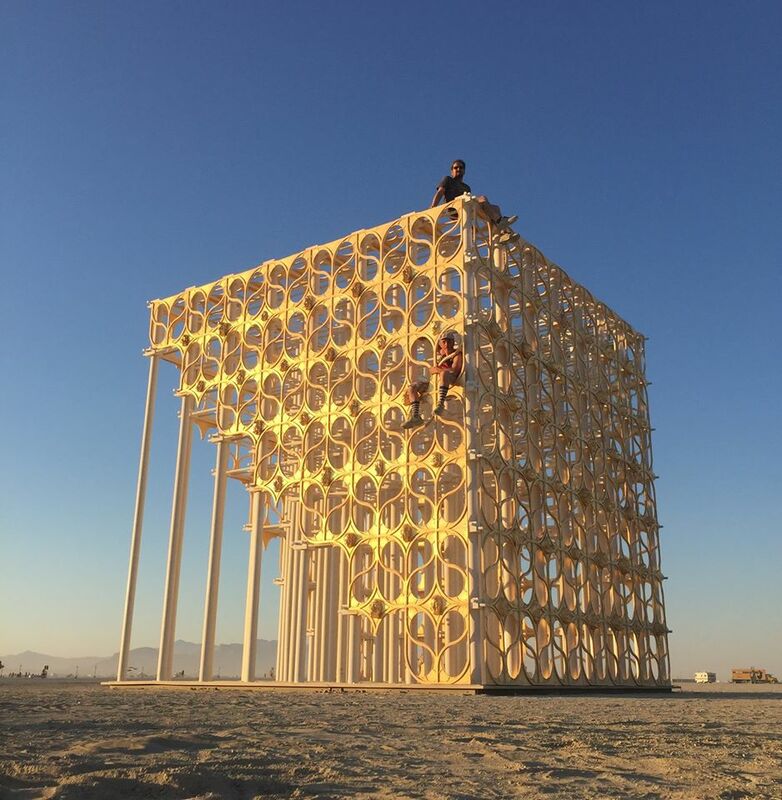 The ORB will share Playa space with this year’s headlining temple from Arthur Mamou-Mani: the spiraling Galaxia, a timber tower inspired by the movement of planets, galaxies, and the universe as a whole. ﻿ No word yet if Anish Kapoor will set his sights on the ORB. And a monumental metal “XOXO” sculpture (XOXO by Laura Kimpton with Jeff Schomberg). No Spectators will put multiple large installations front and center, many of which were commissioned specifically for the show, including a temple from sculptor David Best. 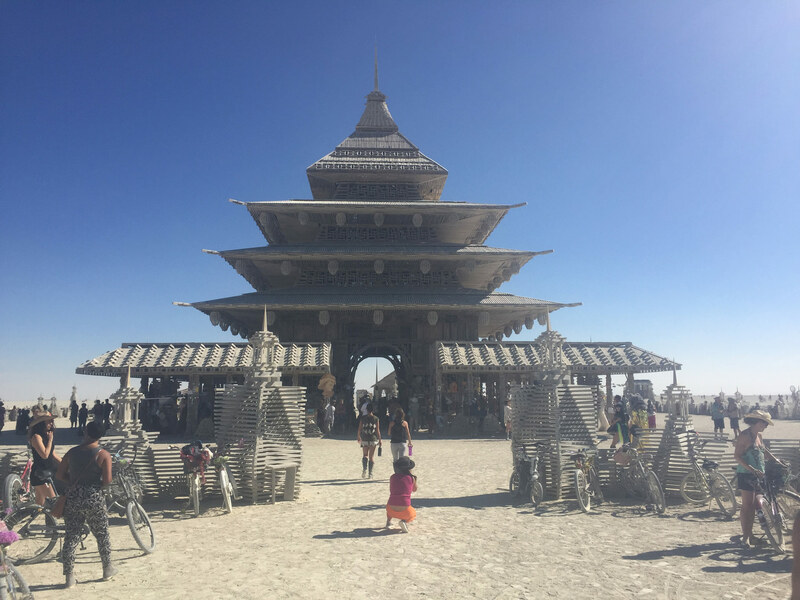 Despite taking place in the middle of Nevada’s Black Rock Desert, Burning Man has always had a heavy architectural and planning component to the festivities. Technically complicated pavilions and temples go up every year, such as 2018’s digitally fabricated Galaxia, and the temporary city that houses 70,000 residents every year serves as a proving ground for radical urban planning ideas. No Spectators sprung partially from the desire to spread the Burning Man gospel, as organizers admit to the Times, as well as the opportunity to tap a wellspring of previously un-exhibited work. For the Smithsonian’s part, the museum has committed to upholding the festivals’ ideals, having kept corporate logos away from the art, hiring local “burners” to help patrons appreciate the pieces, and commissioning a history of the festival to contextualize the works. 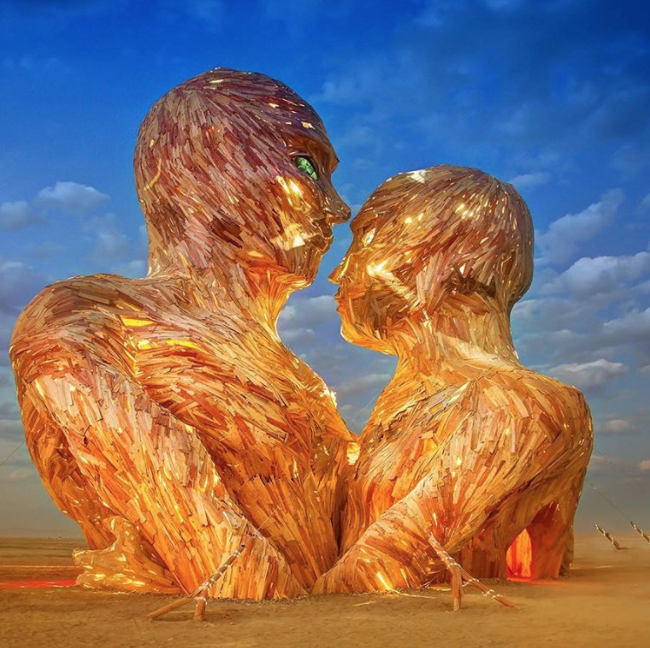 No Spectators: The Art of Burning Man will run from March 30 through January of 2019. It's that time of year again. 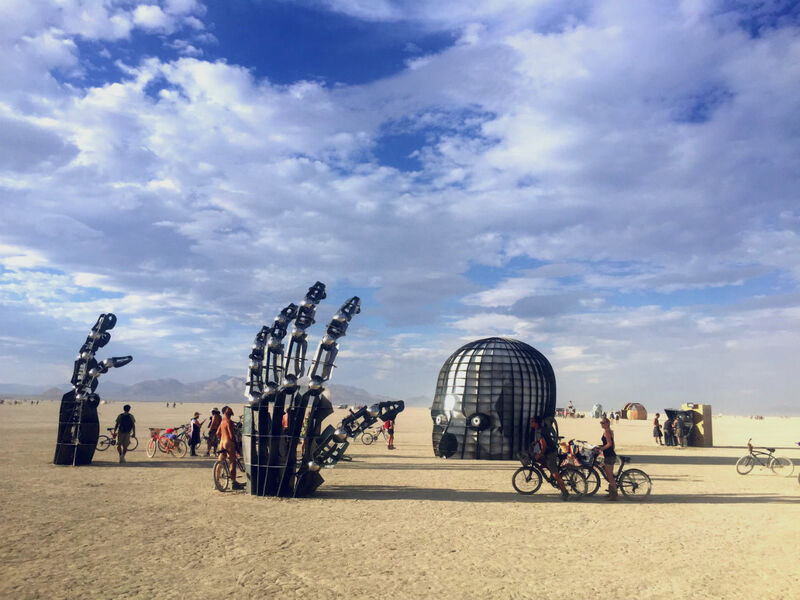 The time when scantily clad, goggle-wearing Instagrammers take to the Black Rock Desert in Nevada and post pictures of the exotic sculpture that populates the central area, commonly known as the playa. This year's theme for participants was "Radical Ritual." The festival officially started today and as always, there is a wealth of whacky art to feast upon, all of which ranges in scale and eccentricity. Notable installations include: Tree of Ténéré by California foursome Alexander Green, Mark Slee, Zachary Smith, and Patrick Deegan, a 32-foot-tall tree made from 25,000 leaves and 170,000 LEDs that reacts to biorhythmic and sound; Gummie Bear Mandala Pyramid by Long Beach artist Karla DelCarpio, which is made from 100,000 hand-cast gummy bears and rises to 12 feet; and Zachary Coffin's Temple of Gravity, a returning installation that encourages visitors to climb on hanging rocks. Images of these, and more can all be found below. A full list of the 2017 Black Rock City honoraria recipients can be found here. The Architect’s Newspaper (AN) was posting images all last week from Burning Man, the yearly festival that takes place in the Nevada desert (see our highlights from the opening and the third day in). AN was represented by Andrew Krebs of SOM’s Los Angeles office; he’s been supplying us with images and videos. These images can be found in our coverage of the week. Here is an Instagram roundup of some of the most intriguing installations and designs that were present at this year's festival. The Architect's Newspaper (AN) will be posting images all week from Burning Man, now underway in the Nevada desert (see our highlights from the opening and the third day in). AN is being represented by Andrew Krebs of SOM's Los Angeles office; he's been supplying us with images and videos. Scroll down to see more from Instagram! We'll post more as we receive updates. The Architect's Newspaper (AN) will be posting images all week from Burning Man, now underway in the Nevada desert (see our highlights from the opening). AN is being represented by Andrew Krebs of SOM's Los Angeles office; he's been supplying us with images and videos. Scroll down to see more from Instagram! We'll post more as we receive updates.